Moroso 99406 - Fender Cover 34" x 22"
JEGS Fender Covers are made from easy-to-clean, heavy-duty vinyl that resists acid and grease. Non-skid backing protects your vehicle's finish and holds the cover steady. 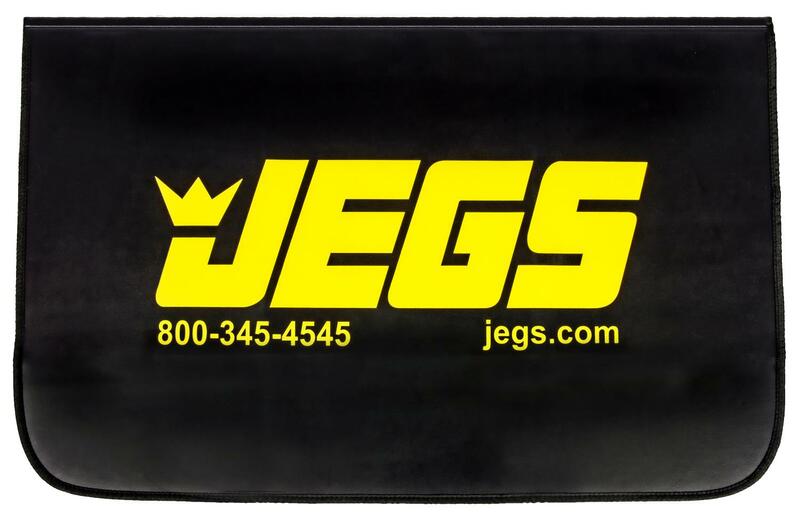 The JEGS logo shows your support for the best in performance and prices! JEGS Fender Covers are made from easy-to-clean, heavy-duty vinyl that resists acid and grease. Non-skid backing protects your vehicle's finish and holds the cover steady (magnetic version also available). The JEGS logo shows your support for the best in performance and prices! 65012 is rated 4.7 out of 5 by 36. Rated 5 out of 5 by CeeJay from Works well and looks great I bought this item a few weeks back and I'm loving it. Rated 5 out of 5 by SOC202 from Great Gift Got for my dad this Christmas. He is elbow deep in his 1978 Corvette ever second he can be. He loves them he feels it proctects his fenders from chips and scratches on the paint. Rated 5 out of 5 by Kadee from Just what I needed The mats work great, and stick to the fenders, just keep them clean to avoid scratches. I did make a modification. I have a 1940 Ford so, the fenders are larger than modern cars. I cut the stiches where the magnets are held and unfolded that portion of the mat. That small additional amount was enough to cover the entire fender. Rated 5 out of 5 by Capjr from Fender cover I bought them to protect my cars finish, glad I got them. Excellent product. Rated 5 out of 5 by george69 from I ordered this fender cover a short time ago and now I'm wondering why I didn't order two. This item is outstanding.